Transitioning to college life at a new school can be difficult. That difficulty is multiplied when a student is starting college in a new country. That's the reality facing international students at SUNY-ESF, according to Emily Quackenbush, coordinator for international students. "ESF has around 175 international students, not counting international students who are here as research scholars," she said. International students at ESF come from Korea, Africa and South America and many other countries. The class of 2018 alone welcomed international students from five different countries this year, according to Quackenbush. Every November, the U.S. Department of State's Bureau of Educational and Cultural Affairs promotes International Education Week in an effort to support and advertise international education both in the United States and abroad. ESF will host a series of events in conjunction with International Education Week beginning Nov. 16 to "bring awareness to how international our campus is," said Quackenbush. Laura Crandall, director of student involvement and leadership, has worked with Quackenbush to plan the week's activities. In the past, activities included sampling indigenous foods from around the world, cultural performances and a film screening. Both the Undergraduate and Graduate Student Associations (USA and GSA respectively) are also expected to host activities. 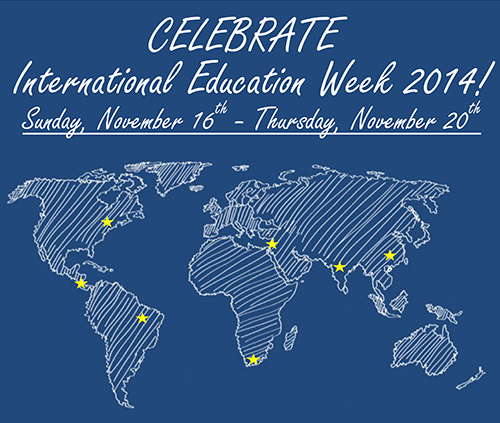 Ultimately, International Education Week gives students "exposure to different ways of thinking," said Crandall. "There are all sorts of great learning opportunities," she added, even for non-international students. Students who are considering studying abroad are especially encouraged to attend, as there will be information presented on different opportunities to study abroad. According to Crandall, students from all over the world come to ESF because "it's recognized as a top environmental school." ESF's relationship with Syracuse University and its centralized location are also factors that draw students to the college. Event organizers expect around 200 people to attend this year's International Education Week events. For more information about International Education Week, contact Emily Quackenbush at equacken@esf.edu or Laura Crandrall at ldcranda@esf.edu.